The influence of built urban infrastructure on stream chemistry was quantified throughout the drainage network of the tropical Río Piedras watershed, San Juan metropolitan area, Puerto Rico. 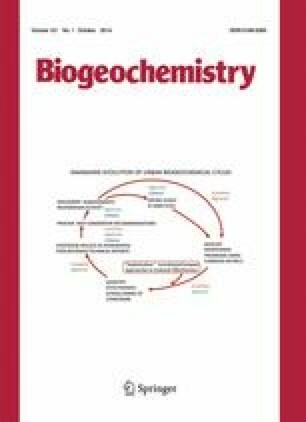 Urbanization and failing domestic wastewater infrastructure appeared to drive changes in surface water chemistry throughout the watershed. Mean baseflow concentrations of chloride (Cl), ammonium (NH4), dissolved organic carbon (DOC), dissolved organic nitrogen (DON), and phosphate (PO4) all increased with urban infrastructure, while nitrate (NO3) and dissolved oxygen (DO) decreased. These patterns in stream chemistry suggest that sewage effluent from failing or illegally connected sewer pipes has a major impact on surface water quality. Concentrations of Cl, DO, and NH4 in stream water were most strongly related to sewer pipe volume, demonstrating the tight connection between urban infrastructure and stream chemistry. The loading and transformation of NO3 and NH4 were modeled along the river network and NH4 loading rates from the landscape were strongly related to urban infrastructure, whereas NO3 loading rates showed only weak relationships, highlighting the importance for incorporating NH4 dynamics into river network models in urban environments. Water quality appears to be severely impacted by sewage in this tropical basin, despite large investments in built infrastructure. The high temperatures in the Río Piedras exacerbate water quality problems by reducing saturation DO levels in streams, and intense rainstorms tax the ability of built infrastructure to adequately manage overland flows. These problems are likely typical of much of the urbanized humid tropics. We thank Alonso Ramírez, Jorge Ortiz-Zayas, and Debora Figueroa-Nieves for logistical and field help. Additional field help was provided by Adam Baumann and Daniela Cusack. We thank Jose Seguinot Barbosa, Olga Ramos and Ferdinand Quiñones for help with obtaining spatial data layers. Our stream research was initially funded by the Lotic Intersite Nitrogen eXperiment II (LINX II; DEB-0111410). Subsequent support was provided by the NSF Luquillo Long-Term Ecological Research Program (DEB-0620910) and NSF ULTRA-EX awarded to Puerto Rico Conservation Foundation.